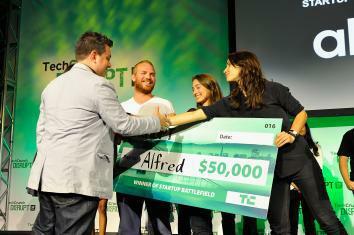 TechCrunch Disrupt SF: Butler app Alfred Club wins best startup of 2014. An Alfred Club co-founder (above) presents at TechCrunch Disrupt 2014 as Bill Hewlett and David Packard roll in their graves (not pictured). 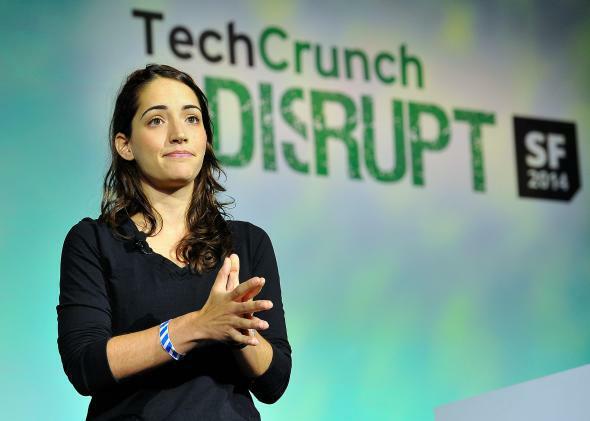 Every year the tech blog TechCrunch holds a competition for tech startups at its New York and San Francisco “TechCrunch Disrupt” conferences and crowns a winner at the end. Over the years, the competition has proven to be something less than a fountainhead of world-changing ideas. Past champions include a conference-calling app, a car-sharing service that is not Uber or Lyft, and a half-hearted “Second Life” ripoff that hasn’t been heard from since 2012. Afterward, your “Alfred” will head over weekly to drop off your clean laundry, put it in the closet, drop off your household supplies, and replace supplies as needed—like putting new paper towels on towel holder, for example. He or she will also put your groceries away and make sure the house is spotless. Jargon aside, what exactly differentiates “an Alfred” from a plain old personal servant is not entirely clear. Perhaps it’s the fact that “Alfreds” apparently come unburdened by individual names of their own. Which is nice, because real names can be hard to remember and disconcertingly humanizing, like when you go to a fancy restaurant and they serve your fish with the head still on. Just a couple of hard-working Harvard B-Schoolers, living the dream. Perhaps the most innovative thing about Alfreds is that they cost just $99 a month. At that price, they’re sure to disrupt the antiquated business models of conventional, non-“shared-economy” servants, whose bloated cost structures include such extravagances as job security, a stable income, shelter, and sometimes even basic health care. It seems the co-founders came up with the idea for a class they were taking at Harvard Business School. No doubt Clay Christensen would be proud. Alfred’s big win is doubly impressive when you consider that TechCrunch founder Michael Arrington, who just happens to be an investor in Alfred, didn’t even participate in the final judging process this year, according to an ethical disclosure in Perez’s article. In his absence, Alfred’s plucky Harvard grads had the difficult task of winning over a highly diverse panel of six other fabulously wealthy tech luminaries, at least a few of whom may have had no direct financial stake in it. That it prevailed in the face of such odds is a testament to unbridled capitalism the sharing economy, systemic inequality the Silicon Valley meritocracy, and the enduring power of the whims of a handful of self-regarding billionaires great ideas.